I became fascinated with the Presa Canario breed when I was just a small boy living in Spain. I saw the dogs for the first time at Park El Retiro in Madrid. When I returned to Spain in 1967 to study medicine in Cadiz, I was fortunate to reacquaint myself with the breed. Finally in 1992, I acquired my first Presa Canario, and started Gran Tenerife Kennels of Puerto Rico. In 1996, after several trips to Spain and its Canary Islands, I was fortunate enough to find an outstanding young male that was available for sale. That dog changed everything for myself and for the entire Presa Canario breed in the United States. During that trip, Luis Ortiz, my friend and professional handler, and myself visited many kennels in and around Madrid looking for good dogs to add to my program. It was fate that Jazz came into my life. While in a little town just north of Madrid we stopped at a café for a drink. We happened upon a man walking a fine male Presa Canario. We stopped him and talked, asking him if he had any puppies from this male. „No puppies”, he explained, „but I do have a young adult son of his.” We decided to look at the dog. Jazz was just 18 months old then, but already a very fine looking specimen. But there were two things about him that made me worry. His ears were cropped off so low and his character was so strong, I worried that he would not make a good dog for showing. I decided to purchase him anyway, if nothing else but to use him for breeding. Little did I know then what this unruly teenage dog would end up accomplishing. Jazz had such a confident and proud attitude, that Luis and I decided to begin showing him and see what happened. He entered his first show in November of 1996 and, much to our delight, took Best of Show in his first time out. I was very thrilled and wanted to campaign this dog fully. Luis was concerned, as his temperament was very strong, and he was very hard to handle in the ring around other dogs. The first 6 months was very hard work for him, but Jazz continued to win and improve in behavior. For 23 straight months Jazz was shown, always with Luis handling, and earned an unprecedented 64 Best in Show wins. 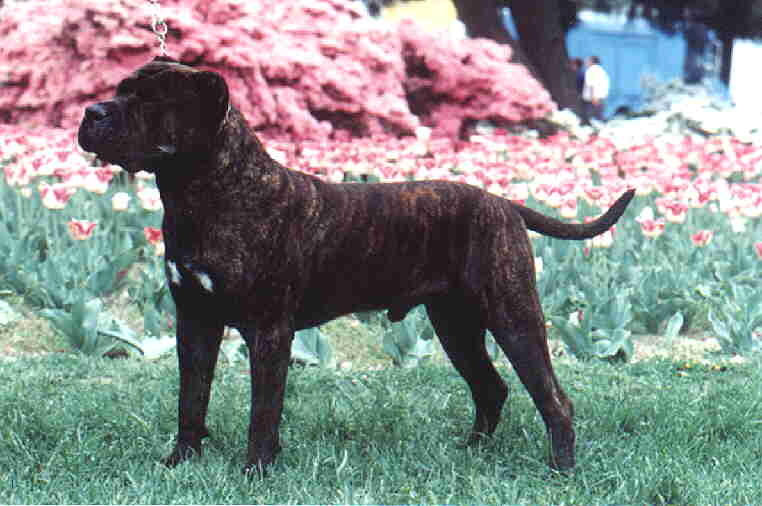 He was the number 1 Presa Canario with American Rare Breed Association from 1996 through 1998. In 1997 he became the first Presa Canario to be number 1 working group dog, just missing number 1 all breed honors. He earned champion titles from over 10 different US and Canadian clubs, including ARBA, CRBA, WWKC, CKC, IABKA and PCCA. He is also a national champion of Puerto Rico. He never once lost the breed in all that time. 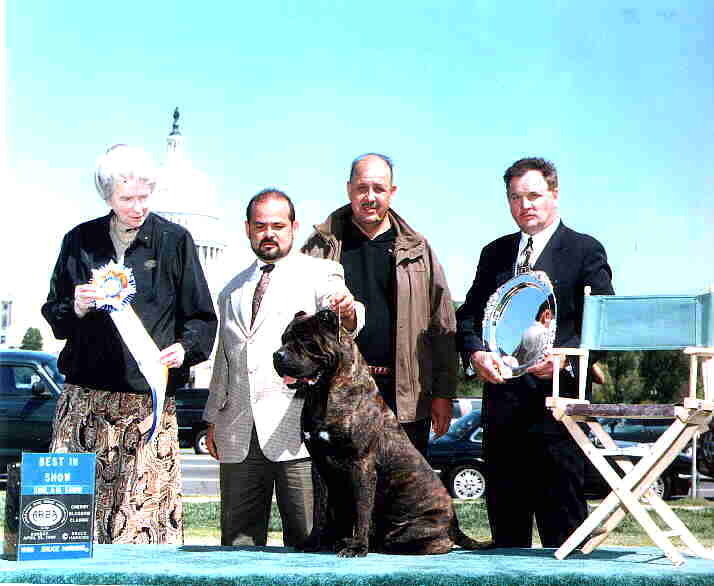 Jazz was Best Adult male at the PCCA National Specialty of 1998 under Presa Canario Specialist Judge Agustin Lopez Melo, who was flown over from Gran Canaria, Spain for this event. Jazz’s last show of his record setting run was in September of 1998. After taking his 64th Best in Show award, he returned home to Florida with Luis to prepare for the next weekend. Unfortunately, shortly thereafter, Jazz suffered a career ending ACL injury. Never able to complete the 1998 show year, he still finished as ARBA’s number one dog of all breeds. Becoming the first Presa Canario to do so. In 1999, Jazz was brought to Washington DC’s Cherry Blossom Classic to be presented with his award for top dog of 1998. The Cherry Blossom is the largest rare breed event in the US, with over 400 dogs entered that weekend. We had no plans to enter him in any of the shows. But when Luis and Jazz went around that ring and the crowd applauded, Jazz who had not been shown in over 7 months fired up like his old self. You could see the excitement in the dog’s eyes to be back in the ring. With some encouragement from our friends and the nod by Luis, Jazz was brought out of retirement for one last show. Jazz took his 65th and final Best in Show award of his career under notable AKC all breed judge Mrs. Anne Clark. Mrs. Clark has judged all over the world and has the distinction of Westminster Best in Show to her credit. She has called Jazz one of her top ten favorite dogs of all time. Jazz is now permanently retired to stud. He has sired only 4 litters in 4 years, but already has 3 Champion offspring, with many more to come. 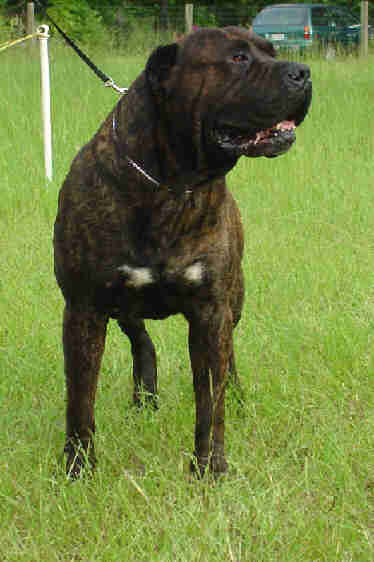 In addition to being the most titled Presa Canario dogs in the world, Jazz is also health cleared. He is certified free of Hip Dysplasia by the Orthopedic Foundation for Animals OFA# PPC8G25M-T and the first certified for patallas, OFA# PA1/40/M/P-T. He is CERF (Canine Eye Registration Foundation) normal. He was temperament tested and passed under the IABKA. As ambassador for the Presa Canario breed, Jazz did more to elevate the dog in the United States than any other dog has to date. Since his arrival here, the number and quality of dogs has increased here in the US. 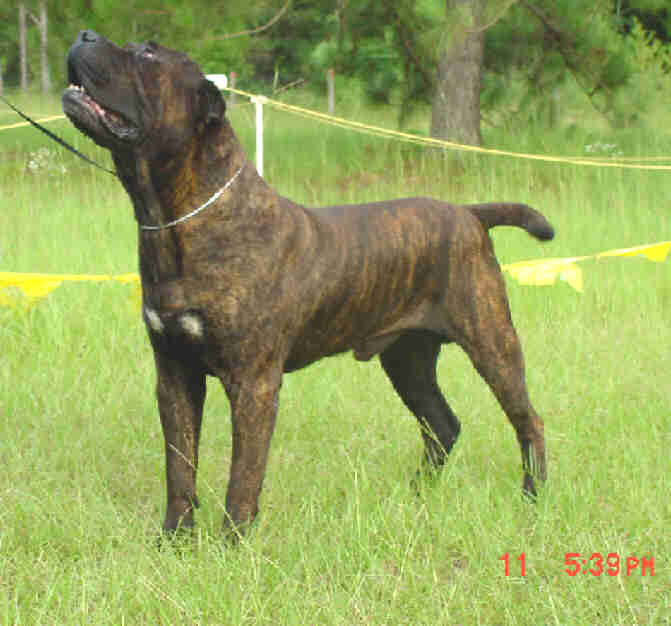 With his impressive show records, he has made the Presa Canario a show favorite. He has set a standard, which will be very hard to reproduce. I am very proud to have him honored as Molosserworld’s Dog of the Month. Dr. Antonio Gallardo, Gran Tenerife Kennels.